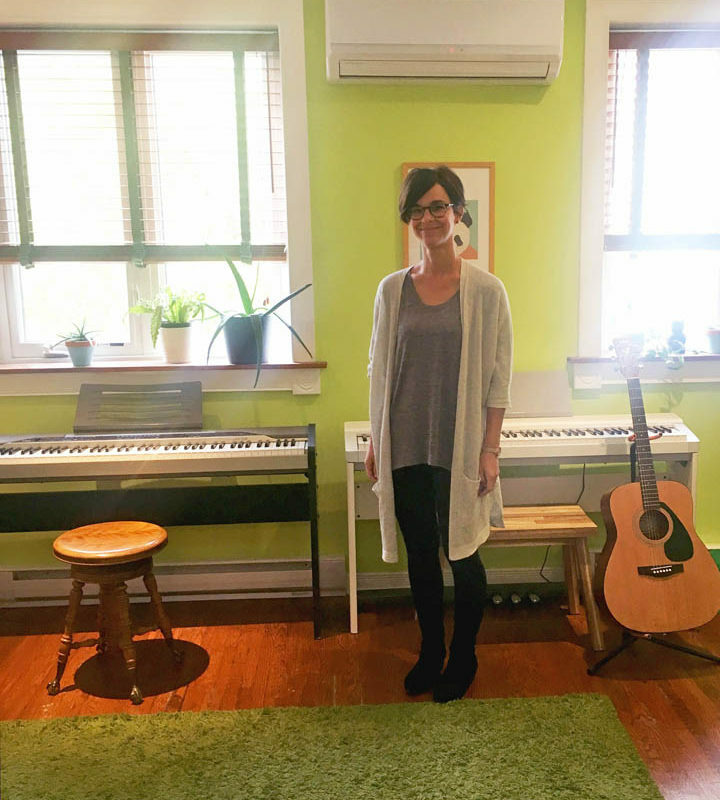 Julie Sousa is the owner of Annette Street Music, located at 317 Jane Street, in Baby Point Gates. I officially opened in Baby Point Gates in 2014 (at 317 Jane St.), but I have been at this location for 1 1/2 years. Starting my own business happened pretty organically. I have been a piano teacher for almost 20 years. I had other career paths along the way, but once I committed to teaching full time, it really snowballed. I was teaching out of my apartment on Annette St. (hence the name, Annette St. Music) with a friend of mine, who taught guitar. Eventually we got so busy that we had to look for a larger, more permanent space. We offer private lessons in Ukulele, guitar, piano, violin and voice for children and adults. We also offer group lessons for preschoolers (ages 3 and 4), and young musicians (ages 4 and 5). In addition, we offer a junior choir program for children aged 5 to 7, and a choral group for older children. We have a unique approach to teaching music, which involves determining the best approach and tailoring classes to best suit a student’s learning style, abilities and interests. Rather than following one teaching method, such as Royal Conservatory, we implement a variety of method materials into our teaching repertoire. Like most small business owners, I wear a lot of hats; I’m the administrator, office manager, cleaner, marketing manager, accountant, etc. I often arrive at the studio early in the day to prepare to for lessons and do administrative work. Most of our children’s lessons begin right after school, but we do have lessons as early as mid-afternoon for those with more flexible schedules. My day ends after our last lesson, which is usually between 8 and 9 pm.. I would say that my biggest success is the fact that we have built such a strong community around music. There are families who have met each other through our studio and established friendships, and there are students who have studied with me since I was teaching out of my apartment. The ensemble music and group programs are especially gratifying for me as a music educator, because I get to offer kids the invaluable experience of making music as a group. It is wonderful to watch kids rise to the occasion, collaborate and support and one another through music. The biggest challenge is that you never know what to expect. There is a huge learning curve to owning and operating a small business, and you are often learning on the fly. But, it also teaches you resilience, and I’m grateful for the experiences and all of the life lessons learned along the way.